There's a shortage of women in the Faroe Islands. So local men are increasingly seeking wives from further afield - Thailand and the Philippines in particular. But what's it like for the brides who swap the tropics for this windswept archipelago? "People told me to go outside because the sun was shining but I just said: 'No! Leave me alone, I'm very cold.'" Moving here six years ago was tough for Athaya at first, she admits. She'd met her husband Jan when he was working with a Faroese friend who had started a business in Thailand. Jan knew in advance that bringing his wife to this very different culture, weather and landscape would be challenging. "I had my concerns, because everything she was leaving and everything she was coming to were opposites," he admits. "But knowing Athaya, I knew she would cope." There are now more than 300 women from Thailand and Philippines living in the Faroes. It doesn't sound like a lot, but in a population of just 50,000 people they now make up the largest ethnic minority in these 18 islands, located between Norway and Iceland. In recent years the Faroes have experienced population decline, with young people leaving, often in search of education, and not returning. Women have proved more likely to settle abroad. As a result, according to Prime Minister Axel Johannesen, the Faroes have a "gender deficit" with approximately 2,000 fewer women than men. This, in turn, has lead Faroese men to look beyond the islands for romance. Many, though not all, of the Asian women met their husbands online, some through commercial dating websites. Others have made connections through social media networks or existing Asian-Faroese couples. For the new arrivals, the culture shock can be dramatic. Officially part of the Kingdom of Denmark, the Faroes have their own language (derived from Old Norse) and a very distinctive culture - especially when it comes to food. Fermented mutton, dried cod and occasional whale meat and blubber are typical of the strong flavours here, with none of the traditional herbs and spices of Asian cooking. And, although it never gets as cold as neighbouring Iceland, the wet, cool climate is a challenge for many people. A good summer's day would see the temperature reach 16°C. Athaya is a confident woman with a ready smile who now works in the restaurant business in Torshavn, the Faroese capital. She and Jan share a cosy cottage on the banks of a fjord surrounded by dramatic mountains. But she's honest about how difficult swapping countries was at first. "When our son Jacob was a baby, I was at home all day with no-one to talk to," she says. "The other villagers are older people and mostly don't speak English. People our age were out at work and there were no children for Jacob to play with. I was really alone. When you stay at home here, you really stay at home. I can say I was depressed. But I knew it would be like that for two or three years." Then, when Jacob started kindergarten, she began working in catering and met other Thai women. "That was important because it gave me a network. And it gave me a taste of home again." Krongrak Jokladal felt isolated at first, too, when she arrived from Thailand. Her husband Trondur is a sailor and works away from home for several months at a time. She started her own Thai massage salon in the centre of Torshavn. "You can't work regular hours with a baby, and although my parents-in-law help out with childcare, running the business myself means I can choose my hours," she says. It's a far cry from Krongrak's previous job as head of an accountancy division in Thai local government. But she is unusual in that she runs her own business. Even for many highly educated Asian women in the Faroes, the language barrier means they have to take lower-level work. Axel Johannesen, the prime minister, says helping the newcomers overcome this is something the government takes seriously. "The Asian women who have come in are very active in the labour market, which is good," he says. 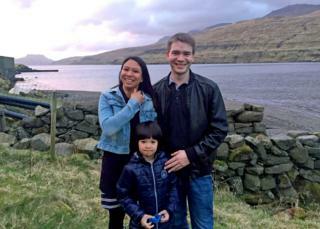 "One of our priorities is to help them learn Faroese, and there are government programmes offering free language classes." 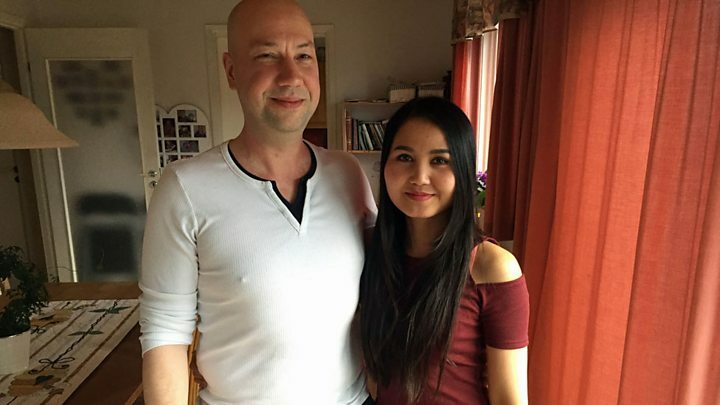 Kristjan Arnason recalls the effort his Thai wife Bunlom, who arrived in the Faroes in 2002, put into learning the language. "After a long day at work she would sit reading the English-Faeroese dictionary," he says. "She was extraordinarily dedicated." "I was lucky," Bunlom adds. "I told Kristjan that if I was moving here he had to find me a job. And he did, and I was working with Faeroese people in a hotel so I had to learn how to talk to them." In an age when immigration has become such a sensitive topic in many parts of Europe, Faeroes society seems remarkably accepting of foreign incomers. Media captionChuen and Karsten have been married for just over a year. They met on a dating website called Thai Cupid. "I think it helps that the immigrants we have seen so far are mostly women," says local politician Magni Arge, who also sits in the Danish parliament, "They come and they work and they don't cause any social problems. "But we've seen problems when you have people coming from other cultures into places like the UK, in Sweden and in other parts of Europe - even Denmark. That's why we need to work hard at government level to make sure we don't isolate people and have some kind of sub-culture developing." But Antonette Egholm, originally from the Philippines, hasn't encountered any anti-immigrant sentiment. I met her and her husband as they moved into a new flat in Torshavn. "People here are friendly, she explains, "and I've never experienced any negative reactions to my being a foreigner. I lived in metro Manila and there we worried about traffic and pollution and crime. Here we don't need to worry about locking the house, and things like healthcare and education are free. At home we have to pay. And here you can just call spontaneously at someone's house, it's not formal. For me, it feels like the Philippines in that way." Likewise, her husband Regin believes increasing diversity is something that should be welcomed not feared. "We actually need fresh blood here," he adds, "I like seeing so many children now who have mixed parentage. Our gene pool is very restricted, and it's got to be a good thing that we welcome outsiders who can have families." He acknowledges that he's had occasional ribbing from some male friends who jokingly ask if he pressed "enter" on his computer to order a wife. But he denies he and Antonette have encountered any serious prejudice as a result of their relationship. Athaya Slaetalid tells me that some of her Thai friends have asked why she doesn't leave her small hamlet, and move to the capital, where almost 40% of Faroe Islanders now live. They say Jacob would have more friends there. "No, I don't need to do that," she says. "I'm happy here now, not just surviving but making a life for our family. "Look," she says, as we step into the garden overlooking the fjord. "Jacob plays next to the beach. He is surrounded by hills covered in sheep and exposed to nature. And his grandparents live just up the road. There is no pollution and no crime. Not many kids have that these days. This could be the last paradise on earth." Tim Ecott is the author of Stealing Water, Neutral Buoyancy: Adventures in a Liquid World and Vanilla: Travels in Search of the Luscious Substance.